Water|Ways is a Smithsonian traveling exhibit made possible by Arizona Humanities and Arizona State University. The Smithsonian’s Water/Ways exhibit dives into Arizona water. Water is an essential component of life on our planet, environmentally, culturally, and historically. The Arizona tour of Water/Ways, is a traveling exhibition from the Smithsonian Institution. The Smithsonian has partnered with Arizona Humanities, Walton Sustainability Solutions Initiatives, and the School of Historical, Philosophical and Religious Studies at Arizona State University to bring the exhibit to Arizona. Water/Ways will tour 12 Arizona rural communities starting in June 2018 and will conclude in March 2020. This national exhibit comes to the Verde Valley August 24 – October 6, 2019, hosted at the Camp Verde Community Library. The exhibit will be paired with local events developed to extend the national exhibit with Arizona water information specific to our community. “Visions of the Verde” is a statewide juried art exhibit focused on the Verde Watershed. Friends of the Verde River, in partnership with Yavapai College, and the AZ Humanities Smithsonian Waterways Exhibit, invite artists from across Arizona to submit art about the Verde River Watershed for a juried art exhibit. “Visions of the Verde” is an all-media juried visual art exhibition that will feature artworks that depict, address, celebrate or are otherwise influenced by the Verde Watershed. We invite all explorations & interpretations of this theme and encourage all media, styles, and techniques. Click here to download the pdf prospectus. Learn more about the Verde Watershed. Arizona Humanities created a “Water is Life” coloring book to complement the Water/Ways exhibit. The coloring book presents the water stories of the 12 communities hosting the exhibit. Each site collected unique stories and artifacts from their respective communities. The result was an array of drawings, historical photos, paintings, and poems. Artist Isaac Caruso transformed these into colorable illustrations. 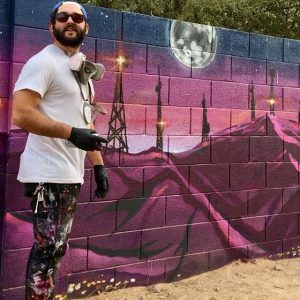 Isaac is an illustrator, graphic designer, creative director and muralist born and raised in Phoenix, Arizona. The coloring book’s front and back covers represent the vibrant and rich history of water in Arizona. Explore the stories of the 12 Water/Ways communities! We invite you to pick up a limited edition coloring book at the Water/Ways host sites. For a full schedule of exhibit sites, visit the Host Sites page. Click here to download printable PDF versions of the coloring book pages. Isaac Caruso is a 29 year old illustrator, graphic designer, creative director and muralist born and raised in Phoenix, Arizona. He holds a BFA in visual communication from NAU and has created some of the largest works of public art in the Valley. His clients include Coachella, Scottsdale Public Art, AZ Humanities, the National Endowment for the Arts, Pabst Blue Ribbon, the Desert Botanical Garden, the City of Tempe, the City of Tucson, Superfly Productions, INFLUX, Phoenix Valley Metro and the Phoenix Suns, to name a few. He works primarily with aeresol, painting all around the world. He is influenced by the communities he creates art for, trying to represent them as he explores their culture. Changing the physical landscape of an area with his pen or spray can is what this artist lives for. His goal is to have a mural on every continent some day, and will continue pursuing this dream in the fall with his first international artist residency in the Arctic Circle.